You can have the convenience of the Kindle apps without, you know, actually shelling out for the Kindle. The apps are free; I have one on my Mac, and another on my iPhone. The apps do not have all the features of the physical device, but for whiling away the time in waiting rooms and airport lounges, they are entirely suitable. I would be happy to buy books, and support local independent bookstores, but I have no more room for books, nor walls for more bookshelves. If Google offers a program to send a portion of my reading dollars to a bookstore, or Amazon’s affiliate program applies to Kindle books — I don’t know — so much the better. Thx for the reminder, Linda. Yes, the Kindle apps for a Mac or PC are quite nice. Text is more readable than on a web page. Do you ever tire of staring at a screen, Griff? Meanwhile, hope for Luddites like me. Tom, I get tired of computer screens but not the Kindle because it’s not back-lit. Its text is crisp and easy to read, even in the bright sun. And if I can’t find my reading glasses, I just up the size of the text. There are times when I enjoy my Entourage (a kindle of sorts) and times when only The Monk can get me a book I want, like a couple of weeks ago when he ordered up a picture book and a Ray Bradbury book that wasn’t available online. The ebook readers are just one more way to get what we want. Plus, Jerry has always been a joy to deal with and that’s one of the big reasons why he’s still around. I think this article might be relevant (The Art of Slow Reading), but I’m not sure. I couldn’t get through the whole thing. Rob, I read about half and skimmed thru the other, I have never liked to read through the excess of words that are often set before us because people are getting paid by each word they write. I will give myself a chance to get used to the cadence of a what may be to me a new author, but if it doesn’t come within one chapter, he or she is Gone with the Wind. I do sort of agree with the author that the computer thing has driven us dumb, and I might add spoiled. I found that happening to me as my reading fair is usually more about nature, biographies, and do it yourself type things. But I do enjoy a good well written novel. And I wish I had someone to talk to about those novels, but all the book clubs I run into don’t really talk about books. They have more pressing agendas, it seems. Anyway, it seems that we need to take the bull by the horns and set aside time to read political, historical, and classical and modern novels at the very least, several hours per week at the very minimum, in a quiet corner. Read the good ones twice and the great ones every so often after that. The Google eBookstore could be a significant benefit to independent bookstores like Powell’s Books in Portland, Ore., that have signed on to sell Google e-books on their Web sites through Google — the first significant entry for independents into the e-book business. You can discover and buy new ebooks from the Google eBookstore or get them from one of our independent bookseller partners: Powell’s, Alibris and participating members of the American Booksellers Association. You can choose where to buy your ebooks like you choose where to buy your print books, and keep them all on the same bookshelf regardless of where you got them. I hope Jerry Bilek at Northfield’s Monkey See Monkey Read will be participating. See the Google eBookstore. I installed the Android app on my G2 phone and began reading Walden for free in less than a minute. I’d like to sell e-books and google may be the most viable partner. the current model offered to independent bookstores is not a good option for me. the annual fees are $3000. I don’t believe google is signing up indie bookstores directly, only through the ABA. If I were able to deal with google directly for a reasonable fee, I’d consider it. here’s a book relevant to the discussion Griff. Now that’s funny! Thx, Jerry. Well, a cartoon on my refrigerator reminds me that anti-social media (books) have a place in our anti-social networks. In a shakeout inducing shivers to rival a suspense novel, one local independent bookseller after another is closing up shop. No more Biermaier’s Books in Minneapolis, for 60 years among the largest used bookstores in Minnesota. No more J. O’Donoghue Books in Anoka, serving the north metro for four decades. No more Northern Lights Books & Gifts in Duluth, calling it quits after 17 years. And no more Cummings Books in Dinkytown, which papered over its windows last month. Others such as the Bookcase of Wayzata — the oldest independent bookseller in the Twin Cities with roots in the 1950s — are hanging on by their book jackets as e-books gain popularity in the booming online market. "We have lost a lot of regular customers to the e-book revolution," said owner Charlie Leonard. Griff, thanks for the link to the star trib story. the bottom line is this is capitalism. bookstores, indies, chain, and, internet, need to serve the customer. the ones that do that the best and profitably will survive. if you like printed books, keep buying them from stores you want to see survive. the same goes for ebooks. if you want indie bookstores to survive, shop there even for ebooks. you can tell your favorite local bookstore to sell ebooks. The ABA has made this possible for indies with a partnership with google. if you like amazon or B&N, shop there. let you money talk. I own a small bookstore. currently, I am considering offering ebooks to my customers. the ABA/google option is too expensive for me at the moment. it might make economic sense for my store in the future. In mid-January, the library went into “OverDrive,” a new online resource of eBooks and audiobooks in a wide range of subjects downloadable onto eReaders, audio players and computers… Library users need only a library card and a compatible electronic device to use the free resource. 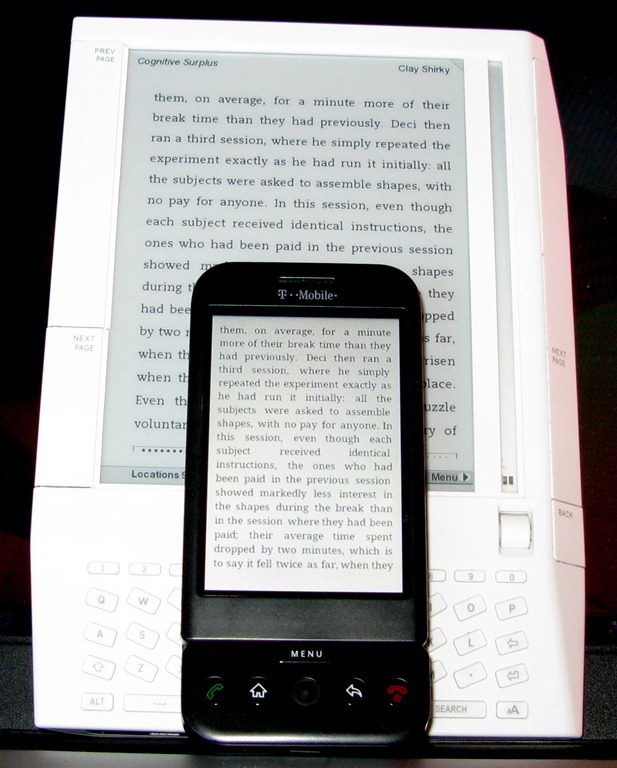 Most eReaders, computers and other mobile devices are compatible with OverDrive, with the exception of the Amazon Kindle. The necessary software is provided without charge through the website. Ever since the holidays, publishers have noticed that some unusual titles have spiked in e-book sales. The “Chronicles of Narnia” series. “Hush, Hush.” The “Dork Diaries” series… But now that e-readers are cheaper and more plentiful, they have gone mass market, reaching consumers across age and demographic groups, and enticing some members of the younger generation to pick them up for the first time. Has your Kindle been properly odorized, Griff? … However, at 970 pages (seriously, Tom, get an editor!) it weighs a ton in hardcover, and would be one reason to consider a kindle. It is twice as thick as my netbook, and weighs about 5 pounds. I however like the feel of a good paper based book in my hands. Its going to take a while for me to move away from that, even though most of my books for work are now electronic. $3000 for the privilege to sell e-books? That doesn’t sound viable at all.